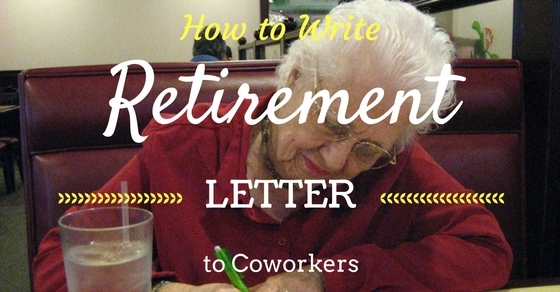 How to Write a Retirement Letter to Coworkers? When a person is retiring from any particular place, they can write a retirement letter to coworkers to show them a sense of gratitude and how much the individual appreciated while they worked alongside them for all the months and years. This farewell letter to colleagues is mainly written by the individual perhaps as a way of still staying in touch with these coworkers after they retire from the job which strengthens relationships between the individual and the other coworkers. The way of writing a letter of retirement is very much different as the person is retiring from the firm and not resigning. Therefore, some of these points need to be kept in mind while writing retirement letter to colleagues. This refers to first thinking well in advance what the individual wants to mention while they are writing the letter of retirement. It refers to the person thinking about certain events which are memorable in the mind of the individual and it would be a great thing that the person mentions such events in the goodbye letter to coworkers. As it is known that the person who is retiring from the firm is writing a letter to their coworkers they need to remember that they are just saying goodbye to their fellow coworkers which is the basic aim of the letter. The emotions of the individual who is retiring may be sad as they are saying goodbye to the person and the farewell should be simple as well as gracious towards the coworkers. Though the mind of the individual who is retiring may be very sad at the moment, while writing the letter they should ensure that the tone they are writing the letter in should be promising for their coworkers for the future. This is with respect to the person showing a positive attitude in the letter that they will keep maintaining a positive and strong relationship in the future and will always stay in touch with one another. This mainly refers to the period since when the person has been working in the company and how they feel about the company. The individual retiring from the company may write a personal letter to the superior of the company and then send out a few common letters to the other fellow co-workers. As the letter is personal, there isn’t a compulsion that the letters written should be similar in nature. When the person is writing a letter regarding their retirement in the company, they need to ensure that they aren’t talking about the term ‘retirement’ in a negative way. They must talk about it in a positive way so that there are no negative feelings arising in the minds of the coworkers and they can continue their work in the same positive way as before in the absence of the person who is retiring. One thing which needs to be ensured by the person who is going to retire from the company is that they need to realize that writing such a letter shouldn’t mention any negative comments or feedback regarding any particular employee or group of employees. Also there shouldn’t be any complains regarding the boss or the superior. This in particular refers to the person talking about the years they have had together working in and for that particular company along with all their fellow co-workers. This mainly emphasizes of the co workers realizing that the individual who is going to retire hasn’t forgotten about all the relationships they have built and wish to maintain with these co-workers for the future. Whenever the person who is retiring from the company is writing a retirement letter to co-workers, they should know that they need to maintain a professional tone at all times. Though the professional nature is essential, the person should also maintain a friendly attitude towards their fellow co-workers as these people are also their friends and can also add some humour to the letter to maintain the friendly tone. It is also an important thing to be kept in mind that while the person is writing a retirement letter to coworker, they can also mention a list of certain achievements which they have achieved along with the company. It may also include certain milestones that have been reached by the company. Basically it contains most of the things which are liked and appreciated by the person who is retiring from that particular company. The person speaking in the letter who is retiring from the company should know that at all times they need to be sincere enough while writing the letter for retirement. This shows that the person is honest enough while mentioning or talking about their co-workers and these co-workers will understand how much they meant in the eyes of the person who is retiring. If the person who is retiring hasn’t had a very strong relationship with certain co-workers, this doesn’t mean that they should act harshly or in a negative way towards those employees while talking about them in the letter. Though they weren’t close with anyone, it should be in the nature of the individual that they continue to maintain a professional but a polite behaviour in the letter. When the letter of retirement is written by the person retiring to all the co-workers, it is known that the letter is a common one. So if the person has maintained a strong relationship with certain people, then they can mention or specify the names of those people in the letter. This will make the coworker realize that they really had a strong bond. At times the individual can also send personal letters or goodbye email to an individual or a team of members if they all have been very close to them. When the person is retiring from the particular organization or company, the individual knows that the other co-workers need to get used to working without that person. So in the letter of retirement, the individual should mention things which will provide confidence in the mind of the other co- workers so that they know what future responsibilities they are given now in the absence of the individual and in what way they need to be carried out. While all things regarding the co-workers are to be mentioned by the individual in the letter of retirement, they should also speak a bit regarding what plans they have set for them once they retire. These certain plans may include if the person is going for a vacation or is travelling abroad, spending their time in peace among nature etc. may also be mentioned by the person. When the person is writing retirement letter to coworkers they need to know that the letter should be briefly written so that no point is missed by the person regarding anything or anyone. This doesn’t mean that the tone of the letter should change as the way of keeping a friendly tone should be continued to maintain. The letter shouldn’t even be of more that one page as everything may fit in an appropriate way in the letter. When the person who is retiring from the company is writing a letter to the co-workers they should be completely satisfied with what all information they are putting in the letter regarding the co-workers. This means that the person should know that whatever they are mentioning regarding the coworkers is true and positive so that no one will have any hard feelings later on in the future. At times when the person is retiring from the company, there may not be any immediate plans in the schedule of the person and they still may be open to working as a part-time worker or a consultant to the company. So such information should be provided in the letter as the co-workers will know if any kind of situation arises in the workplace they know who to contact. When one is writing a letter of retirement to their coworkers, they need to ensure that the letter is written in the same way as a business letter is written on an everyday basis. This letter written in a business style will be acceptable for every co-worker in the firm. You can also copy it and send it by email to other employees. At the end of the letter it is always advisable that the person retiring should provide their personal information to the fellow co-workers if they ever need to contact the person. This personal information in particular should contain the person’s contact information, email ID and their residential address so that the people can still stay in touch with one another. In today’s time it is well known to every individual that how much technology has progressed. So it a well-known fact that sending the letter to the coworkers by E-mail is much more faster, advisable and accessed by the individual in comparison to snail mail. So the person should opt for sending the letter to their co-workers by means of email as there will be no difficulty in that process and no confusion will arise. They can also take the option of sending goodbye retirement email to coworkers. When the person is retiring from the company, they will in every way be experienced enough with the work that is being carried out in the firm. So they should provide a sense of motivation among their fellow employees to continue to work harder in the same and carry out their daily tasks and objectives of the firm so that they can help reach their own personal goals along with all the goals of the company much faster. As and when the letter has been completed and the individual is completely satisfied with whatever they have written in the letter, they shouldn’t immediately send the letter to the coworkers. Instead they must do another additional check for the letter as they may have missed out mentioning about someone important they have worked with. The process of double checking always helps every person as they may find out some mistakes that may have been while writing their letter in the first attempt. So when an individual writes a letter of retirement it may be informal or formal. Even though the letter is an informal one, the level of professionalism should always be carried out by the person and a soothing tone should also be carried out for the entire letter. It is always recommended that a separate letter should be sent to the superior head of the organization and another common letter to the other coworkers. So if a person wishes to present an appropriate and respectable letter of retirement they need to keep all these above-mentioned points in mind so that everything is carried out in a systematic way.